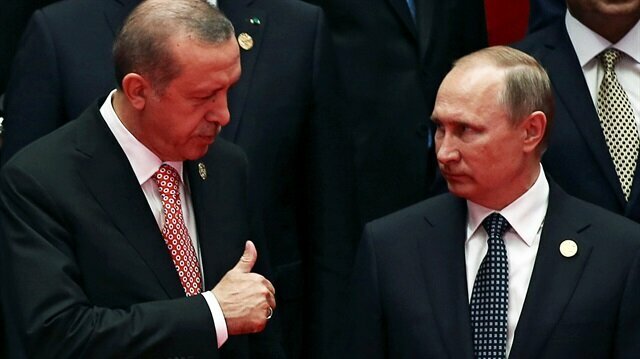 President Recep Tayyip Erdoğan and his Russian counterpart, Vladimir Putin, on Thursday agreed to intensify efforts to convince warring parties in Syria on a cease-fire in Aleppo. The two leaders discussed Turkish-Russia bilateral relations as well as the latest developments in Syria during a telephone call, according to a presidential source who spoke on condition of anonymity due to restrictions of speaking to the media. Erdoğan stressed the importance of implementing a cease-fire as soon as possible in the rebel-held northern city that is under a devastating siege. The pair also discussed Operation Euphrates Shield launched late last month by Turkey and agreed on the importance of eliminating Daesh and other terror groups along the Turkish border, the stated goal of the operation in northern Syria. Erdoğan said the original residents of Jarabulus and al-Rai have already begun to return from Turkey. Economic ties between Turkey and Russia were also discussed, including energy sector cooperation, the Akkuyu Nuclear Power Plant and Turkish Stream projects, as well as the re-launch of charter flights between the two countries. Erdoğan and Putin conveyed that they are pleased with the pace of the normalization process between Turkey and Russia after a brief seven-month hiatus that began late last year and, the ability of the leaders to quickly sort out issues during meetings in St Petersburg and China, the source added.